Stamina to outlast Kentucky's extreme weather was a fundamental requirement of the liner selected for this pond. The Ohio River, the largest tributary of the grand Mississippi River, is one of the greatest assets to the communities along its path. Serving as a major transportation route for even the earliest Americans, the Ohio River is also important today as a source of drinking water and as a favored recreation destination for outdoor enthusiasts. In Henderson, Kentucky, protecting this natural resource is a primary goal. The Henderson Water Utility operates the Henderson Wastewater Treatment Plant, which services the 36,000 residents and the industries of the City of Henderson, Henderson County and the nearby city of Corydon. First established in 1954 as a primary treatment facility, the plant was upgraded to also provide secondary treatment in 1975. The Wastewater Collection System covers approximately 25 square miles and consists of some 190 miles of sanitary and combined storm-sanitary sewers. The activated sludge plant provides secondary treatment and has a treatment capacity of 7.5 million gallons per day. As part of a plant upgrade in 1991, an influent surge pond was added to eliminate wet weather bypasses. The surge pond is subject to constant filling and emptying, which leaves the pond's liner often exposed to the Kentucky elements - a climate zone where temperatures swing from 25 degrees below zero (F) to upwards of 100 degrees. Stamina to outlast Kentucky's extreme weather was a fundamental requirement of the liner selected for this pond. This steered the Henderson Water Utility straight to XR-5® by Seaman Corporation. For applications that require high strength, low thermal expansion and contraction, and unmatched UV ray and chemical resistance, XR-5 geomembrane is the industry's longest proven containment solution. This rugged reinforced geomembrane delivers strength characteristics in a 30 mil liner that require over 80 mils in an unreinforced product. A proprietary woven polyester base fabric is the foundation of XR-5's impressive dimensional stability, tensile strength and puncture resistance. An adhesive coat saturates these fibers to bond the substrate with the coating system, making delamination impossible and edge coating unnecessary. The finished top and back coat contain an exclusive ethylene copolymer based noncrystalline coating compound that inhibits stress cracking and maintains the membrane's long term flexibility - even in the most challenging environments. This combination of characteristics allows designers to use steeper slopes and avoid applying protective layers over the membrane. Furthermore, because it is flexible, XR-5 can undergo a second stage of manufacturing in a controlled factory environment, which yields single sheets as large as 15,000 square feet. 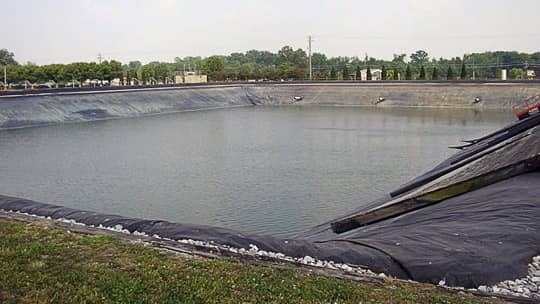 The low thermal expansion contraction characteristics of the XR-5 geomembrane make seam maintenance zero, unlike competitive HDPE products, which have high seam maintenance requirements, especially in exposed applications like this influent surge pond at the Henderson Wastewater Treatment Plant. After more than 15 years of exposure to various organic waste contaminants, blistering UV rays and Kentucky's extreme temperatures, the original XR-5 geomembrane installed at the Henderson Wastewater Treatment Plant in 1991 is still protecting the surrounding grounds today. Contributing to the improvement of water quality in the Ohio River, this plant also helps to provide a cleaner water source for many cities downstream of Henderson all the way to the Gulf of Mexico. With over 30 years of proven success in demanding applications around the globe, XR-5 by Seaman Corporation sets the industry standard for strength, durability and performance.